Work started on building the church of St. Michael and All Angels, Underwood, in 1889 and it was consecrated thirteen months later in September 1890. It is a building of considerable size, considering that at the time of its planning the community was quite small. Although the village was expanding due to colliery developments in the area, there were few houses and the situation was slow to change until houses were built opposite the church in the early 1900s. The pace of development was driven by the church’s benefactor, Earl Cowper of Beauvale, who owned the land, organised the architect and contractor and the majority of source materials. He also met all the costs. 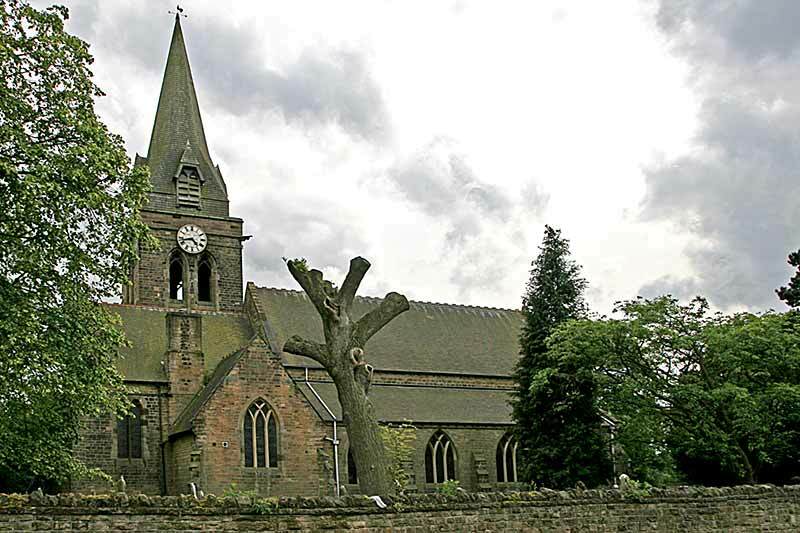 The church sits on an elevated site just off the road that connects Eastwood to Mansfield (A608) and the lofty tower can easily be seen from miles around. Closer viewing reveals that the tower is actually roofed with oak shingles, over a stone-built tower complete with a clock face on all four elevations. The entire exterior is of stone and is set in a large well-kept church yard, enhanced by the lych gate leading from the aptly named Church Lane. Although the church was only 28 years old when World War I ended, the families and friends of the 23 parishioners who did not return from the conflict raised the funding to erect not one but three memorials to their sacrifice. Today St Michael’s is surrounded by housing of various periods, the colliery no longer exists but the spirit of the community survives, and is evident in the warm welcome visitors receive at the weekly social meetings held in the church. Particular thanks to Doug Fletcher for research on this entry and to Geoff Buxton for the photographs.